Hot on the heels of the introduction of Setra’s ComfortClass and TopClass coach ranges, the company has unveiled a new family of entry level Setra models that extend the existing MultiClass product range. Available in three lengths initially, they come in below the existing MultiClass offering with more basic specifications. This will enable the Setra brand to participate in an increasingly competitive market place dominated by the leading European brands but also targeted by manufacturers further afield. As with the rest of the Setra range, they will not be offered in right hand drive form for the UK or Irish markets. Closely related to the Mercedes-Benz Intouro range, the existing UL range (the name derived from the German Uberland Linie meaning over land line) are primarily employed as inter urban, rural service and school buses, as well as for local excursions for which purpose they have underfloor luggage capacity. 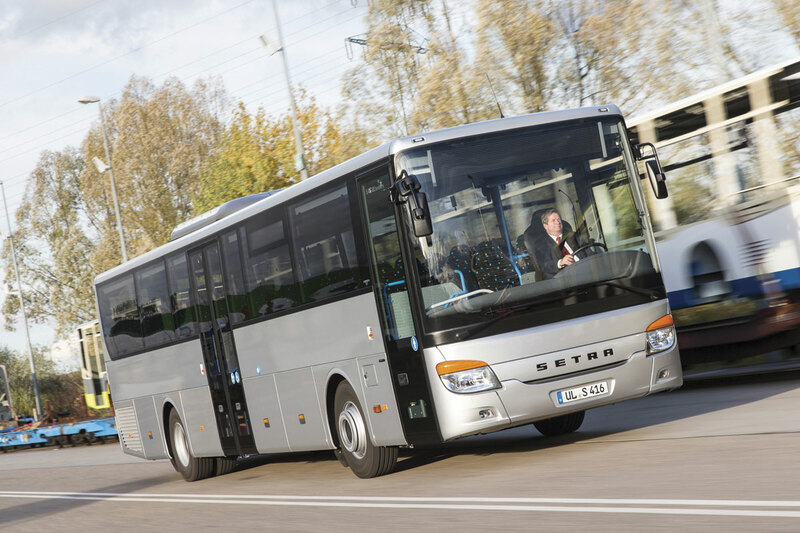 In Europe, Setra has been involved in the supply of vehicles for this sector, as well as the luxury coaches for which it is best known in the UK, for many years, consistently representing more than a quarter of total Setra sales. Over 11,000 of the MultiClass version of the Setra 300 series were delivered and, to date, over 5,000 MultiClass 400 Series buses have been built. The existing UL line up includes the 10.805m, 12.2m and 13.04m S412UL, S415UL and S416UL two-axle models and the three-axle S417UL and S419UL which are 14.05m and 14.98m respectively. There are also the 12.2m S415H and 13.04m S416H derivatives which have a floor height of 900mm rather than 760mm as well as a more coach like specification. Across Europe, the trend is toward fewer operators running the mixed bus and coach operations for which the UL is ideally suited, more tenders and a concentration in the mid price sector with increasing demand for standardised vehicles with standardised equipment. To meet this need in respect of interurban line operation, a demand has been identified for a range of two-axle products with simple specifications. The three new models are the 12.2m S 415 UL Business, the 12.7m S 416 UL Business and the 13.38m S 417 UL Business. 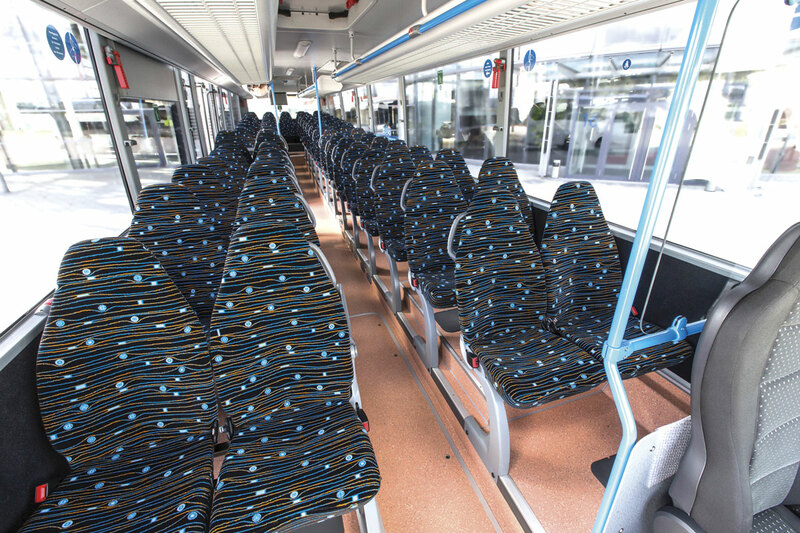 Including four tip up seats in the centre wheelchair platform area, these offer maximum seating capacities of 55 (S415UL Business), 59 (S416UL Business) and 63 (S417UL Business). They are also certified for standing passengers so that, for instance, the S416UL Business can accommodate 59+17+0 or 55+22+1 wheelchair. All are 2.55m wide and 3.17m high. Compared with the S416UL, the S416UL Business has the same passenger capacity but is 0.34m shorter within the wheelbase and has an improved turning circle of 22.3m compared with 23.3m. 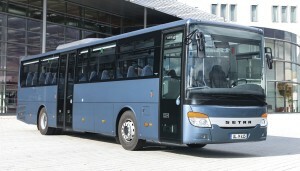 The attractiveness of the S417UL Business compared with the S417UL is more marked because it has two rather than three axles, weighs less and is 0.67m shorter giving the same 63 seat capacity (including four tip-ups), although with the longer wheelbase the turning circle increases from 21.6m to 23.9m. The standard layout has a glazed front entrance door and a single width centre door though a double width centre door, with or without cassette step lift, is an option. Air conditioning, luggage racks, and stop request buttons can also be specified. 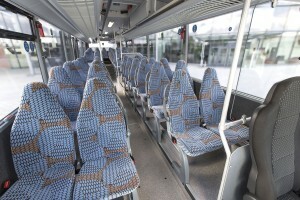 The standard seat is the Setra Transit service seat but Setra’s Route seat with spring cushions is an alternative. All versions have an underfloor luggage compartment. The mechanical specification is standard Setra. The latest 7.7-litre OM936 six-cylinder, vertical, in-line engine with common-rail injection is used. Two outputs are offered; either 299hp (220kW) or 354hp (260kW) with peak torque figures of 1,200Nm and 1,400Nm respectively. The standard gearbox is the Mercedes-Benz GO 190-6 manual with the GO 250/8, ZF Ecolife and Voith DIWA.6. also available. Safety systems include anti-lock braking (ABS), acceleration slip regulation (ASR), Electronic Braking System (EBS), Brake Assist System (BAS) and roll-over resistance according to ECE-R66. 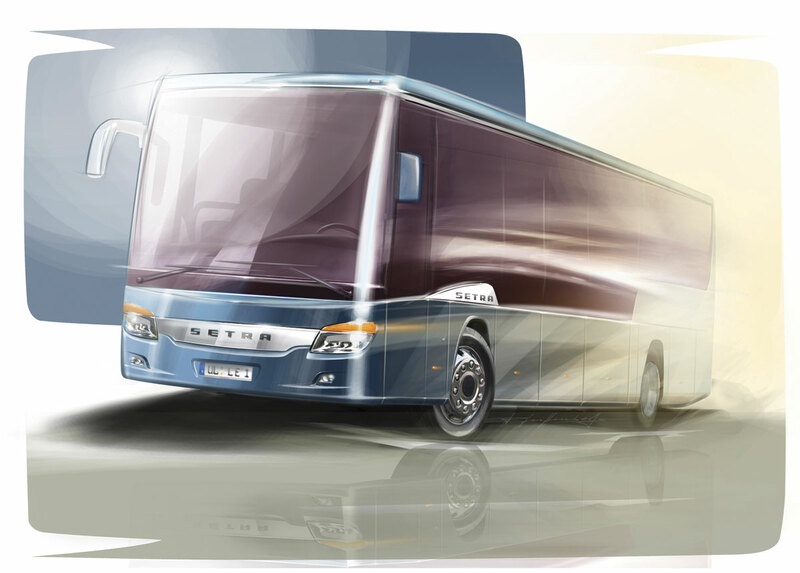 In a first for a Setra product, the MultiClass Business range is to be built at the Hosdere plant in Turkey, home to the Mercedes-Benz Tourismo range of vehicles, rather than the Neu Ulm plant that is Setra’s main manufacturing facility. This is an important element in ensuring that it is competitive with other players in the sector at which it is aimed. It appears that, for the future, Setra is also considering producing a low entry model that will be the equivalent of the Citaro LE. Artist’s impressions have been released of what looks a very attractive vehicle, though no other details on this have yet been released. With the availability of the Setra brand in the UK all but at an end, with only a very small number of new S416GT-HD ComfortClass models still available for purchase, the MultiClass won’t be coming to the UK, but it is nevertheless interesting that EvoBus can offer a 63 seat product on two axles within the latest weight constraints in Europe (presumably based on a 19-tonne GVW figure) when maximum capacity can be an issue on other members of its UK product line up. It is the sort of capacity in a low cost vehicle that would interest UK operators, but I’ve been given no indication that anything similar is about to be developed with the steering wheel on the right.